in this exercise, students should only use the past simple and past continuous tense of the verbs provided in brackets and according to the rules their teachers have already presented to them and fill in the blanks. they could also ask questions about every picture or person in the picture and elicit as many questions as possible. 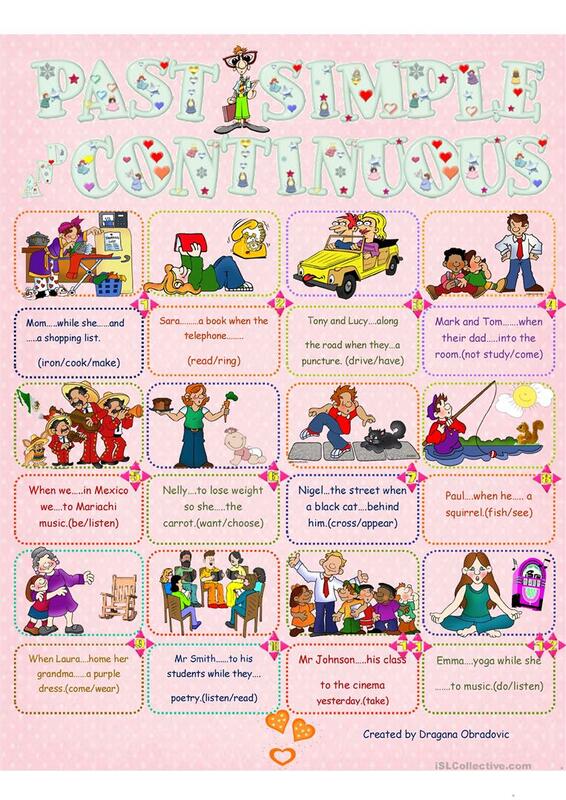 The pictures could also be used to practise other tenses such as the present continuous tense.Eg. "what is Emma doing in picture 12?" Students could describe the pictures or their teachers could use them as flash cards and hand them out to their students who could then play a game. Eg. "Guess what Emma is doing in my flash card". The present printable, downloadable handout is meant for elementary school students at Elementary (A1) level. It is great for consolidating Past simple & continuous tense in English, and was designed for honing your pupils' Listening, Spelling, Speaking, Reading and Writing skills. It is focused on the vocabulary topic of Actions.